Your living or family room is a multipurpose space, where you watch TV, play games, and gather as family; therefore, it’s essential to have lights for every purpose. At Hortons Home Lighting in La Grange, we have an amazing selection of living room lights, and can help you create the ideal design and find the perfect fixtures for every area of the room. 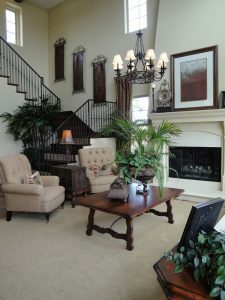 You might have a sitting area, a viewing area, and areas dedicated to other tasks, and without the proper lighting, those spaces won’t get used as much. You’ve most likely heard people talk about “layering the lights” in your living room, but you’ve never been quite sure what they mean. You have a genera light fixture, perhaps with a ceiling fan, and a few lamps around the room to add extra illumination, and that seems to be fine. While that can create a functional space, it may not highlight the design and architecture of your living or family room. By adding rail and track lighting, you can highlight a textured or accent wall, or focus attention on a piece of artwork. If you have high or vaulted ceilings, upward-focused light will create a dramatic effect while illuminating the entirety of the ceiling. Floor and table lamps provide task and accent lighting, and can help you define each area of the room. If you’re looking for new living room lights, or you have questions about lighting design and installation, please come to Hortons today. We’re proud to serve La Grange and the surrounding Chicagoland area, and look forward to helping you!